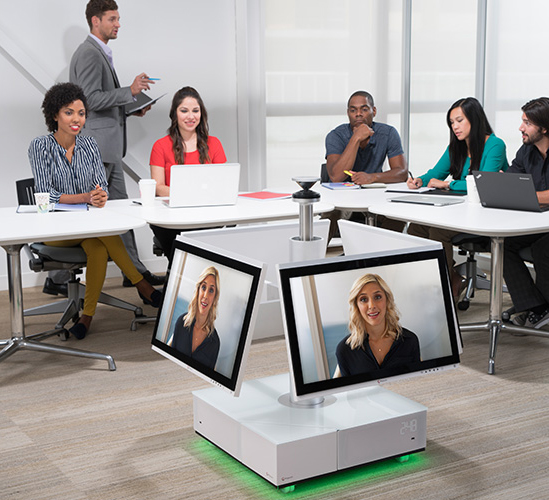 Something truly exciting is happening in the world of video conferencing. Something that changes how we collaborate. To date, the group video conferencing experience—that is, people sitting at a table and looking in one direction at a screen displaying one or more people at a far site—has had its issues. One being that individuals in the back of a far site group can disappear off in the distance. It doesn’t have an effect on board meetings and presentations, but it’s not conducive to the free-flow of ideas that you’re looking for in a collaborative gathering. 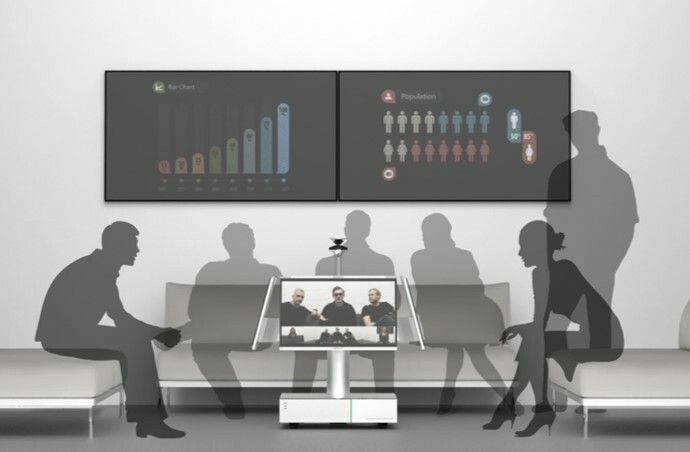 Enter something that’s changing that in a big way: the Polycom RealPresence Centro. 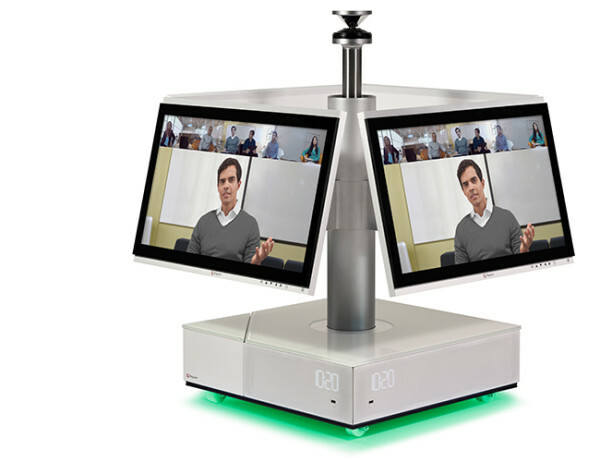 The Centro represents a fundamental shift in video conference collaboration, and it’s got the folks in the conferencing industry abuzz, us included. We’re excited. And if you’re serious about collaboration, I think you will be too. But what are we talking about when we say “collaboration”? We’re talking about a group of people, sitting in a circle, brainstorming and developing ideas. While someone may be taking the lead in the meeting, there is no position of power—no one sitting at the head of a large conference table calling the shots. A collaboration space is a safe place where anyone can contribute anything. Everyone feels equal. More and more companies are building out spaces like these in order to optimize the contributions of all employees. Surely, your team has great ideas. One of your biggest challenges is drawing those ideas out and building upon them in a comfortable setting. The circle’s the key. Hearkens back to our hunter/gatherer days. Verified by several anthropological studies as the most powerful way to communicate as a group. One of those things that you know intuitively, but it’s cool to have it backed by science. But how do you recreate that experience with someone calling in from a far site? That’s where the team at Polycom started. 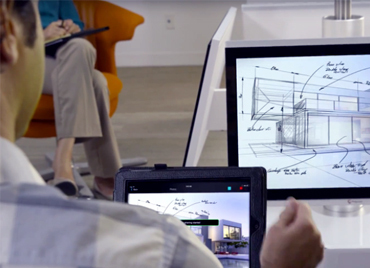 How do you incorporate someone seamlessly into a collaborative space? Improve the experience of everyone in the room to see and interact with the far site. Improve the experience of folks at the far site to view and interact with everyone in the room. Provide collaboration tools and experiences users didn’t even know they wanted. 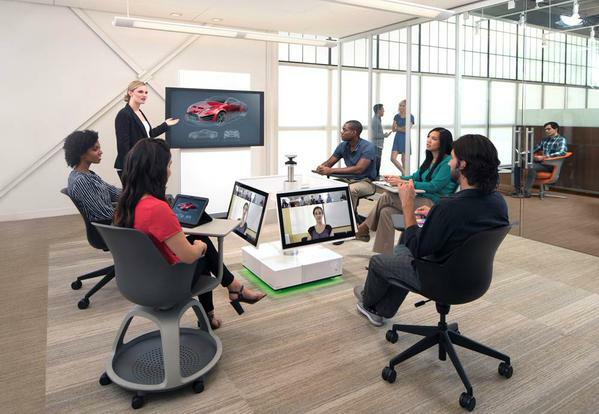 Polycom’s own collaboration was successful, and out of this exercise was born the design for the RealPresence Centro. 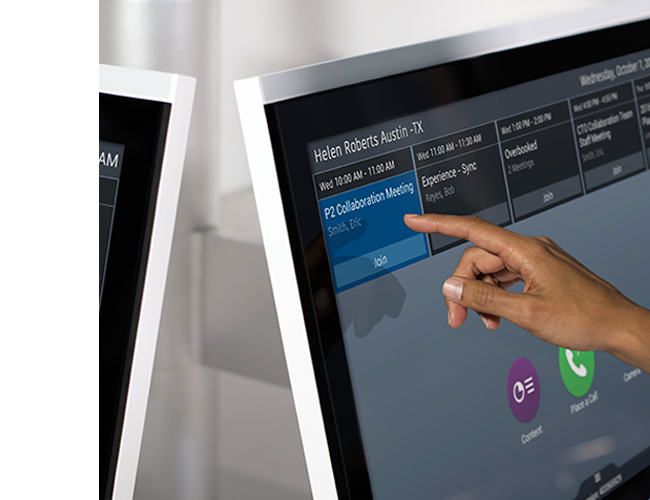 RealPresence Centro changes the way we meet and collaborate so that the technology is no longer a distraction to engagement and interaction, but a seamless, empowering experience that defies distance. It’s time technology fades into the background, and not our teammates on the screen. Let’s say Tom, Sarah, Bill, and Ashley are meeting in a breakout room. They sit on comfortable furniture (purchased specifically for hours of comfortable lounging), facing one another in a circle. Jen is calling in from a far site. In the middle of the on-site circle, placed on the floor, is the RealPresence Centro. It’s low enough so that everyone can see the people across from them. The four monitors one each side of the Centro are tilted up to face (and be easily accessed, because they’re touch-screens) by everyone in the circle. Jen appears on the monitors. Everyone is facing her directly from where they sit – not turning 90 degrees when she has something to say (like they would in a board room). Nice. A panoramic shot of all participants. She can see who is talking to who, and how everyone is reacting to what’s being said. A large image of the person talking at the time. She sees these things courtesy of a 360-degree panoramic camera positioned on top of the Centro. This Smart Camera picks up on who’s talking, and the system puts them front and center on Jen’s screen. Not only that, but if the person speaking gets up (like to walk to a whiteboard or similar), the camera will zoom out to make sure that they’re fully framed, and whatever they’re referencing is in frame as well. Ashley wants to share a slide deck with the group. It appears on the screens on the Centro, and is the main view on Jen’s screen at home, with the panoramic view of the other participants still in sight. No reactions or social cues are missed due to Jen being off-site. This is the basic, fundamental strength of this system – uninhibited collaboration. Its simple premise is the source of all its power. True collaboration happens when there are no barriers to human interaction and presence. When people gather in a circle, are supported in comfortable seating and have a clear line of sight and sound to every person on the team – whether sitting next to you or on screens. I mentioned the touch screens already. But really, sticking with their theme of simplicity and ease-of-use, this is a must – and Polycom’s nailed it. Use the intuitive interface to toggle screens and share multimedia presentations. The Centro is damned smart. Using visual and audio tracking, the primary image displayed on the far site screen is that of the current speaker. Someone else starts speaking, it’ll switch to them like it was a planned TV shot. 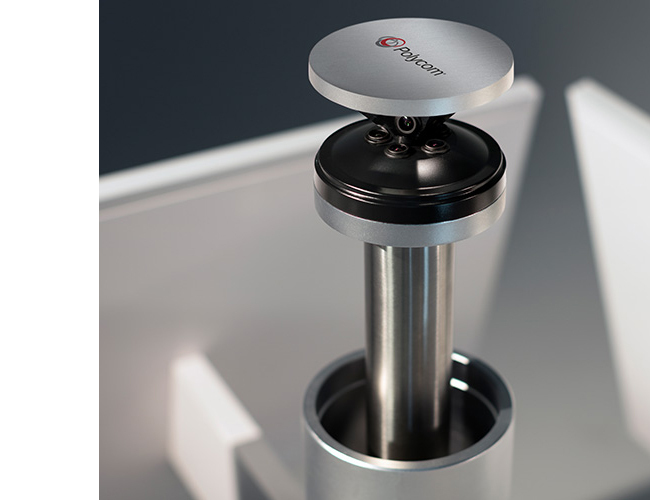 Put the RealPresence Centro in the centre of your collaboration space. Plug it into your ethernet and a power source. Two cables. End of installation. Remember that 360-degree camera? You should hear what it does for the audio quality of your video conference. Be heard from anywhere in the room. Polycom’s patented noise cancelling technologies makes sure that sounds like typing and paper rustling don’t get in the way of the important stuff. The far site can access the meeting from any device, too. Laptop, tablet, smartphone – whatever video-enabled device that connects to the internet will do. Polycom obviously sought to make this an all-in-one station. Insert USB’s and charge devices. Keep track of time with the handy LCD clock. It even integrates with Microsoft Lync workflows. Finally, everyone’s going to get an equal seat at the table.